this day in crime history: june 5, 1968 | Nobody Move! 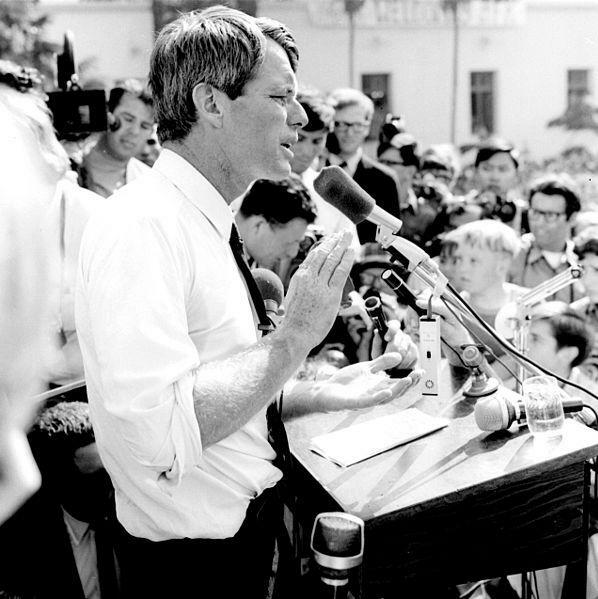 On this date in 1968, Senator Robert F. Kennedy, a candidate for the Democratic presidential nomination, was shot in Los Angeles, CA. It was just after midnight when Kennedy finished addressing supporters at the Ambassador Hotel’s Embassy Room ballroom. His advisers decided it would be best to leave the hotel through the kitchen, so as to avoid reporters who were pushing for an impromptu press conference. As the entourage moved through the kitchen, they were confronted by 24 year old Sirhan Sirhan, an immigrant with Jordanian citizenship. A Christian of Palestinian descent, Sirhan was angered by Kennedy’s support of Israel. He produced a .22 caliber pistol and shot Kennedy repeatedly. Kennedy fell to the floor as his security detail, consisting of former FBI agent William Barry, decathlete Rafer Johnson, and pro-footballer Roosevelt Greer, wrestled Sirhan to the ground and subdued him. The gun discharged several times during the struggle and five people were injured. After being subdued, Sirhan managed to break loose and grab the gun again. He attempted to shoot it, but he had already used up all his ammo. Senator Kennedy was taken to the Hospital of the Good Samaritan for emergency surgery, but the prognosis was not good. At 2 AM the following morning, a spokesman announced that Kennedy had died. Sirhan Sirhan was tried by the State of California for murder. He was convicted of murder and sentenced to death in the gas chamber. His sentence was commuted to life by a California court in accordance with the People v. Anderson decision. He is currently incarcerated at California’s Richard J. Donovan Correctional Facility in San Diego and has been denied parole over a dozen times. A very tragic day, and one that (sadly) completed the triumvirate of assassinations. (JFK and MLK being the prior two). Hasn’t seemed that long, either.